The Getty Museum’s exhibition Photography in Argentina, 1850-2010: Contradiction and Continuity comprises nearly 300 photographs made by 60 Argentine artists since the invention of the medium. Immense and ambitious in its scope, the project is broken down into four thematic groupings that demonstrate the parallels between the history of photographic production in Argentina and its distinct and shifting identity. Highlighting the significant position of photography throughout the major social and political moments in the country’s colonial and postcolonial past, the exhibition aims to illustrate the complex and heterogeneous character of Argentina and its disparate narratives from the rest of Latin America. Organized by Judith Keller, Senior Curator of Photographs at the Getty Museum, and Idurre Alonso, Associate Curator of Latin American Collections at the Getty Research Institute, Photography in Argentina is part of Pacific Standard Time: LA/LA, the Getty Foundation initiative connecting over 70 Southern Californian arts institutions through coordinated exhibitions and programs of Latin American and Latino art. While PST: LA/LA seeks to present and connect the diverse people and locations across Latin America and Los Angeles, Argentina itself serves as a fascinating case study. 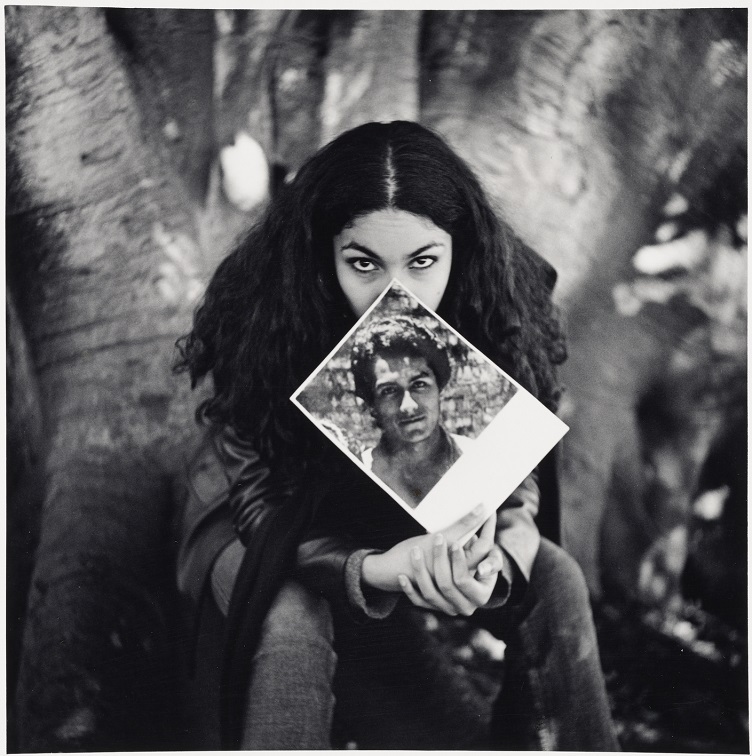 Shaped by its expansive history of immigration and various sources of tumult, the country embodies diversity and change—and photography, the exhibition suggests, has played an essential part in the construction and understanding of its identity. Within the various modes of photographic practice throughout the medium’s history, more specifically, staged photographs occupy a central role. With this overarching focus on fabricated or constructed photographs (defined by the curators as narrative tableaux and staged performances), the exhibition begins with a series of four portraits by Martín Weber (Argentine, b. 1968, Chile) from the series Ecos del Interior / Echoes from the Interior from the mid-to-late 1990s. Weber enlisted locals to pose in various everyday scenes that point to defining moments in Argentina’s cultural history as well as larger issues surrounding the complexities of national identity. In one image, El jugador de ajedrez / The Chess Player (1999), a young male, illuminated by the bright afternoon sun, sits at a café playing chess while a woman looks toward his table with a skeptical, disapproving gaze. 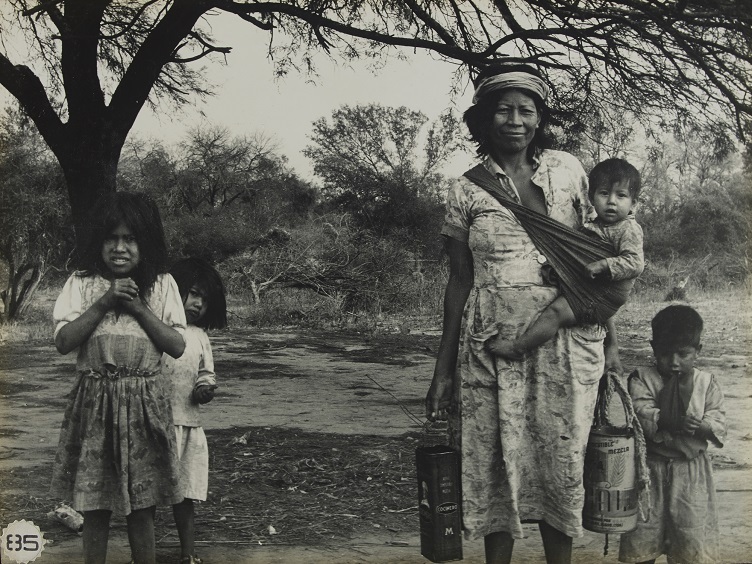 Weber’s photograph represents long-lasting tensions between European immigrants and the criollo (native-born Latin Americans of Spanish descent) in Argentina’s rural interior—a result of the country’s nineteenth century efforts to bring in more European immigrants to increase the population. Another photograph, Barras de Colores / Color Bars (1996) [Fig. 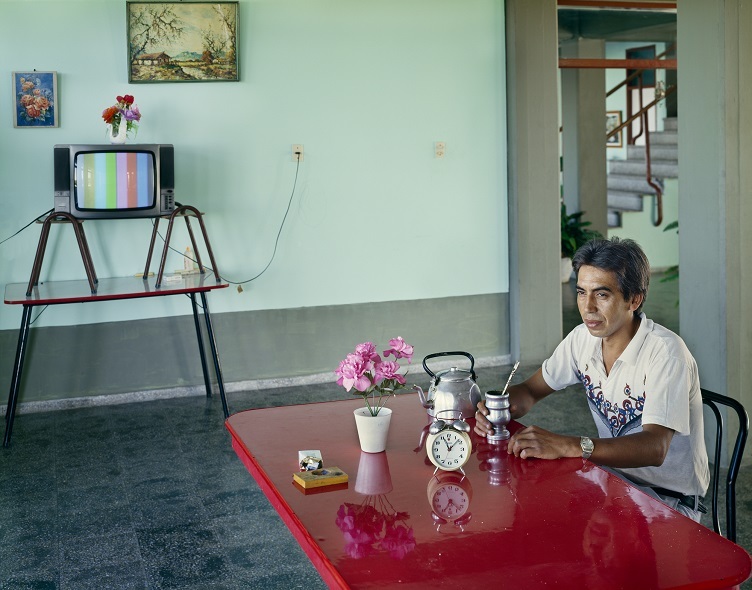 1], again shows a seated man, this time clutching the traditional South American mate drink, with a color television in the background. The title refers to the color bar test pattern on the screen, itself a marker of the introduction of color television in Argentina just in time for the 1978 FIFA World Cup (held in the Argentine city Mar del Plata) while the country was under military dictatorship. Figure 1: Martín Weber (Argentine, born Chile, 1968). Barras de Colores de la serie Ecos del interior / Color Bars from the series Echoes of the Interior, 1996. Silver dye bleach prints. Framed: 84 x 99 cm (33 1/16 x 39 in.). Martín Weber. Figure 2: Gustavo di Mario (Argentine, born 1969). Vilmar de la serie Carnaval / Vilmar from the series Carnaval, 2005; print 2015. Chromogenic print. Image: 50 x 63.1 cm (19 11/16 x 24 13/16 in.). The J. Paul Getty Museum, Los Angeles, Purchased with funds provided by the Photographs Council. In his chromogenic Carnaval series, Gustavo Di Mario (Argentine, b. 1969) staged portraits of young male dancers in full Carnaval attire—colorful beaded headdresses with feathers and bare torsos and legs. Placed within typical scenes of life in Gualeguaychú in the Entre Ríos province (a rural area known for its celebrations of Carnaval), the sexualized male bodies contrast with their surroundings [Fig. 2]. Moreover, the satisfying placement of Di Mario’s images next to a studio photograph by Fotografía Artística de Emilio Galassi (Argentine, active early 20th century) of a young immigrant boy in Carnaval attire from 1911 points to the exhibition’s through-lines of construction and fabrication—not only in photography but in creating one’s own exterior self. The first room of the exhibition, titled “Civilization and Barbarism,” brings together the faces and sites of Argentina’s expanding population through staged contemporary portraits like Weber and Di Mario’s as well as nineteenth century commercial portraits and landscapes in the form of albumen prints, ambrotypes, and daguerreotypes. The studio portraits, in particular, emphasize a unique survey of immigrants, who, utilizing costumes and photographic documentation, sought to establish and communicate their position in a new country. The organization of the exhibition unfolds neatly into three subsequent sections: “National Myths,” “Aesthetic and Political Gestures,” and “New Democracy to Present Day.” Throughout each, we encounter an unruly Argentina in a wide selection of images that simultaneously explore artifice and revelation. “National Myths” tackles constructed portrayals (and omissions) of Argentine figures—from mythical gaucho characters to Argentina’s indigenous population. The proud national symbol and masculine ideal in the form of the gaucho horseman was employed as a kind of promotional Argentine advertisement on postcards and albums. Gauchos were revered and celebrated while the government attempted to conceal and displace the country’s indigenous people. Staged ethnographic photographs by Pierre Petit (French, 1832–1909), for instance, function as troubling documents of captivity. Beginning in the mid-nineteenth century, indigenous people were held as exotic public attractions at the Jardin Zoologique d’Acclimatation in the Bois de Boulogne park in Paris. Meanwhile, this kind of activity coincided with increased government efforts to bring immigrants from Europe to Argentina. However, in her series Aborígenes del Gran Chaco argentine / Indigenous People from the Argentine Gran Chaco (1958–64), German-born, Bauhaus-trained artist Grete Stern (Argentine, 1904–99) used a camera to capture a more intimate and humanistic view of indigenous people in her photographs of families [Fig. 3], schoolchildren, and artisans creating pottery and baskets. Notably, Stern, who left Germany for Argentina via London during the rise of Nazi power, and her Argentine-born husband Horacio Coppola (1906–2012) are credited for introducing modern photography to Argentina with an exhibition they organized in Buenos Aires in 1935. Coppola’s commissioned photographic survey of Buenos Aires’s rapid modernization in the 1930s—cityscapes, public transportation, and monuments like the city’s iconic Obelisk—seductively documents Argentina’s urban progress in stark contrast with Stern’s beautiful portraits of those left behind. Stern and Coppola were the subjects of the exhibition From Bauhaus to Buenos Aires: Grete Stern and Horacio Coppola in 2015 at the Museum of Modern Art, New York, and indeed their photographs on view at the Getty add a rich and crucial layer to the cultural issues and aesthetic developments under investigation. Figure 3: Grete Stern (Argentine, born Germany, 1904-1999). Mujer pilagá con sus hijos. Las Lomitas, Formosa / Pilagá Woman with her Children. Las Lomitas, Formosa, 1964. Gelatin silver print. Image: 30 x 38 cm (11 13/16 x 14 15/16 in.). Private Collection. Figure 4: Julio Pantoja (Argentine, born 1961). Natalia Ariñez, 23 años, estudiante de arquitectura de la serie Los hijos. Tucumán, veinte años después / Natalia Ariñez, 23 Years Old, Architecture Student from the series The Sons and Daughters. Tucumán, Twenty Years Later, 1999. Gelatin silver print. Image: 20.7 x 20.7 cm (8 1/8 x 8 1/8 in.). The J. Paul Getty Museum, Los Angeles, Purchased with funds provided by the Photographs Council. A significant shift occurs in the rooms of “Aesthetic and Political Gestures.” Here, the medium opens up into more political activism and experimental performance in the 1960s and 70s—much like broader histories of photography. Julio Pantoja’s (Argentine, b. 1961) powerful and haunting series, Los hijos. Tucumán, veinte años después / The Sons and Daughters. Tucumán, Twenty Years Later (1996–2001) [Fig. 4], consists of a large grid of fifteen square-format black-and-white portraits. In each image, a young man or woman in their twenties holds up a family photo. The mothers and fathers in these photographs within the photographs are among the 350 professors, students, union workers, and political activists who disappeared under the military operation Operativo Independencia led by Army General and politician Antonio Bussi from 1976–78. Pantoja’s project revisits the devastation of the early years of Argentina’s Dirty War by focusing on the faces of its aftermath and providing a heartbreaking visual method of marking time and loss. 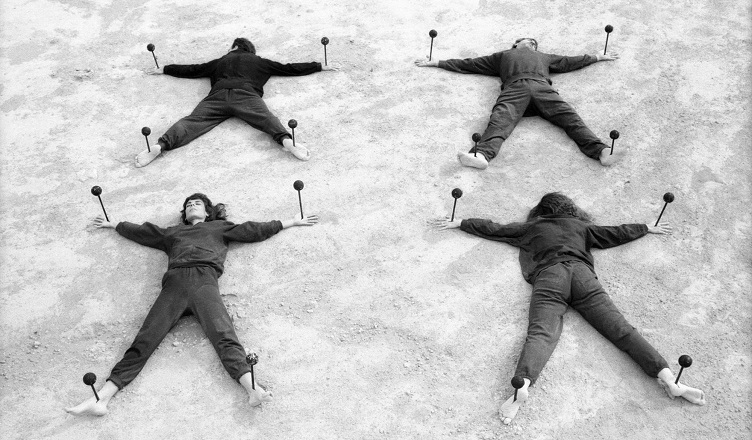 The art collective Grupo Escombros (Argentine, active since 1988) responded to another form of conflict and unrest in the rising inflation and economic uncertainty of the 1980s. Enacting choreographed gestures for the camera, the group makes use of their own bodies to communicate uncertainty about the future of their country. Los escombros, or the rubble, they wager, would be all that remains. The four striking photographs on view, from the series Pancartas / Signs (1988), show black-clothed bodies in various formations—holding blank signs in a desolate landscape, blindfolded and following each other up a treacherous stairway, collapsed amongst a pile of building rubble, and splayed like specimens in a glass case. While their formal and performative qualities recall works by artists such as Valie Export, Charles Ray, Dennis Oppenheim, and others, Grupo Escombros’s interests are primarily foregrounded in social issues specific to their home country. As such, their performance works mark a particular aesthetic moment within art history while also recording a moment of national despair. Figure 5: Sebastián Friedman (Argentine, born 1973). Segurismos #7, 2010-2011, print 2016. Chromogenic print. Image: 59.7 x 80 cm (23 ½ x 31 ½ in.). Sebastián Friedman. “New Democracy to Present Day,” the final thematic grouping, addresses the ramifications of the economic collapse in 2001 and inequality in contemporary Argentine society. Sebastián Friedman’s (Argentine, b. 1973) photographs from his series Segurismos (2010–11) illustrate the insecurity and fear of violence felt by many in the urban middle class. The images demonstrate the lengths taken by city dwellers to protect their homes—installing metal bars on windows or tall impenetrable gates for increased safety—and how these measures ultimately create spaces of confinement and separation rather than community [Fig. 5]. Further emphasis on these feelings of vulnerability and paranoia is evident in the five large, life-size portraits of Argentines posing at home with their guns in Ananké Asseff’s (Argentine, b. 1971) series Potencial / Potential (2005–07). The towering scale of the images, and therefore, the massive size of the weapons, creates an overwhelming feeling of danger and anxiety rather than security. This series arguably illustrates the paradox of photography in relation to Argentina’s cultural history most succinctly. If photographs can assist us in understanding the problems of the past, can they also influence us to examine our actions with more scrutiny in the present? Curatorial decisions throughout the exhibition provoke this timely question, especially when one might consider the powerful (and concerning) connections between the turbulent history of Argentina and current political debates in the United States (Standing Rock, gun control laws, immigration bans, among others). In photographic terms, the exhibition successfully edits an enormous history of the medium by pursuing a very particular thread—that of construction and staging. It assembles an important historical narrative, as seen through photography, and allows us to glimpse the medium’s lasting potential for change, now and in the future. 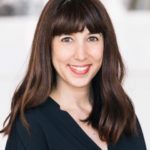 Christine Robinson is a Ph.D. candidate in the Department of Art History at the University of California, Los Angeles, specializing in modern and contemporary art with a focus on the history of photography. She is currently at work on her dissertation—a monographic study of the contemporary photographic work of Sarah Charlesworth.